Comments: EXCESSIVE WRITING May contain heavy wear, excessive highlighting/writing, and/or slight water damage. Supplemental materials such as CDs or access codes may NOT be included regardless of title. Contact us with any questions! Christopher Waterman is Professor of World Arts and Cultures and Dean of the School of the Arts and Architecture at UCLA. 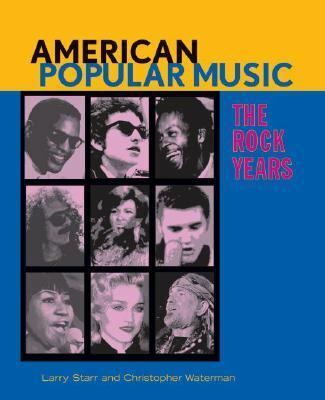 Larry Starr is Professor of Music at the University of Washington.Starr, Larry is the author of 'American Popular Music The Rock Years', published 2005 under ISBN 9780195300529 and ISBN 0195300521. Loading marketplace prices 11 copies from $2.00 How does the rental process work?